Here's one that you can find in the BR stores with better beer selections... the Stone Ruination IPA. 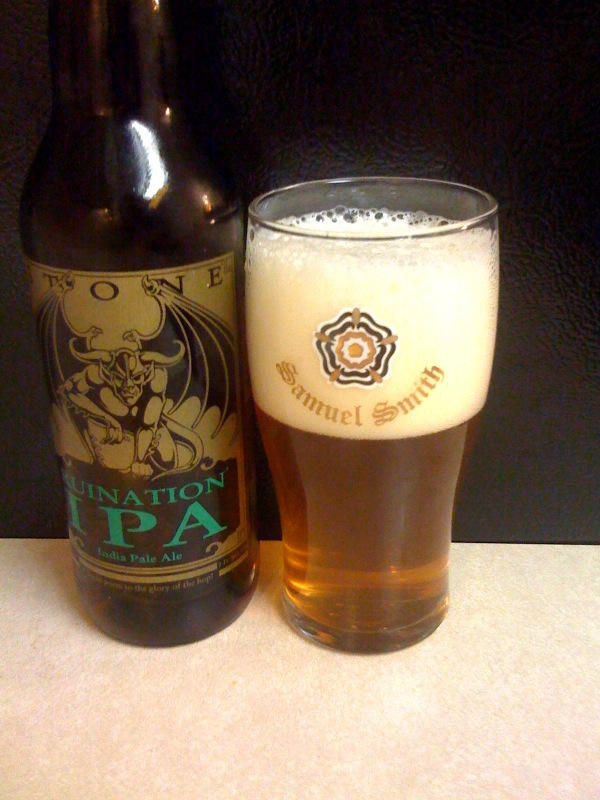 This is out of California and Stone Brewing Co. is a relatively new entry to the Louisiana beer market. They have been considered by some to be the #1 brewery in the world, but that just like, an opinion man. This particular stone selection is actually an Imperial IPA, or double IPA. At 7.7% abv it's on the low end for the style, but if you're drinking beer just to get drunk, this isn't the right one anyway. Dustin Davis brought this particular one over to taste... it pours a clear deep gold color. Great head with good retention and lacing. Attractive but not exceptional. There is a ridiculous smell to it, Dustin says "it's like shoving a hop cone up your nose," and I agree. Just what an IPA should smell like. The taste is hop bitterness up fronts with pine flavors. The bitterness lingers magnificently over a slight malty aftertaste. I love the thicker body to this one, it's like you can chew through the hops to get to that slight malt flavor underneath. One of the better IIPAs I've had and if any of you out there like the hoppy beers and see this one out at the stores, give it a try! Stone Ales at the Chimes! So I guess I've done more reviewing of the Stone beers in the market than any other brewery. That's not really surprising to me, I've been excited to see them here since day one and hopefully places like the Avenue Pub in New Orleans will keep getting their specialty beers on tap and places in BR will keep the bottles coming!